There's been a lot of talk recently about the 2% inflation target, and whether or not it would be a good idea to raise it, or change the nature of the target - to price level or nominal GDP targeting, for example. It's instructive, I think, to use as a starting point the letter addressed to Janet Yellen and the Board, and signed by some of my friends, acquaintances, and people I know of but have never met. The inflation rate over the longer run is primarily determined by monetary policy, and hence the Committee has the ability to specify a longer-run goal for inflation. The Committee reaffirms its judgment that inflation at the rate of 2 percent, as measured by the annual change in the price index for personal consumption expenditures, is most consistent over the longer run with the Federal Reserve’s statutory mandate. The Committee would be concerned if inflation were running persistently above or below this objective. Communicating this symmetric inflation goal clearly to the public helps keep longer-term inflation expectations firmly anchored, thereby fostering price stability and moderate long-term interest rates and enhancing the Committee’s ability to promote maximum employment in the face of significant economic disturbances. 1) 2% inflation is a "longer run" goal, so we should expect to see deviations from 2% inflation in the short run. How long do we have to wait for the longer run? How large are the deviations the FOMC is willing to tolerate? Not specified. 2) The chosen price index that is used by the FOMC to measure inflation is the headline PCE. Not the CPI, the CPI excluding food and energy prices (core CPI), the core PCE, the Dallas trimmed mean index, etc. The headline PCE, dammit. 3) The inflation target is symmetric. The FOMC thus states that it's just as bothered by 3% inflation as by 1% inflation. 1) What's the time horizon? It makes a big difference whether the FOMC is interested in year-over-year inflation (last 12 months), or average inflation over the last 10 years. If it's the former, then past inflation quickly becomes a bygone - no need to make up for a period of low inflation with higher inflation in the future. If it's the latter, then the central bank has to be much more concerned about making up for previous misses. 2) How is the FOMC going to achieve its target? Will it use monetary aggregates as instruments, as in the 1980s or will it use as an instrument an overnight nominal interest rate, as is currently the case? Should there be a large central bank balance sheet or a small-footprint balance sheet? And given the instrument or instruments, which way does the FOMC move each instrument, and how much, in response to deviations in the inflation target? 3) Why 2%? Why not 10%, 0%, -2%, 5%? That's a conventional inflation measure - 12-month headline PCE inflation. Inflation was fairly low in 2015, but from late last year the FOMC has been doing well. Inflation even exceeded the target early this year, and the last observation is 1.7%. To give us a ballpark idea how we might evaluate that performance, consider that the Bank of Canada (inflation targeters since 1991) sets a target range of 1% to 3% (though they look at a whole set of inflation measures). So, by the Bank of Canada's criterion, the FOMC hasn't been out of the 1-3% range very much since the last recession. So, the FOMC's inflation targeting performance, according to the goalposts it set up for itself, has been pretty good over the last 7 or 8 years. The maximum level of employment is largely determined by nonmonetary factors that affect the structure and dynamics of the labor market. These factors may change over time and may not be directly measurable. Consequently, it would not be appropriate to specify a fixed goal for employment; rather, the Committee’s policy decisions must be informed by assessments of the maximum level of employment, recognizing that such assessments are necessarily uncertain and subject to revision. The Committee considers a wide range of indicators in making these assessments. Information about Committee participants’ estimates of the longer-run normal rates of output growth and unemployment is published four times per year in the FOMC’s Summary of Economic Projections. So, to paraphrase, the FOMC is worried about deviations from "normal" unemployment rates and rates of output growth, and cautions that there are forces outside the control of monetary policy that determine what those normal rates are. Since the BLS has been collecting job vacancy data, the only higher observation than the last one in April 2017 was in January 2001. Currently, what exists is an abnormally tight labor market. Real GDP growth, at about 2% per year since the last recession ended, is historically low, but it's well recognized that this ia due to low productivity growth - a factor outside the Fed's control. Some might argue that the employment/population ratio is abnormally low, or that U6 (including marginally attached workers, and part-time employed wanting full-time work) unemployment is somewhat abnormally high, but again it's hard to argue that's not due to factors (demographics, fiscal policy, skills mismatch) outside of the Fed's control. Thus, in terms of the FOMC's own criteria, and qualifications to those criteria, there's nothing happening on the maximum employment front that somehow represents a sacrifice incurred in the fight to control inflation. So what could the letter-writers be complaining about? In years past, a 2 percent inflation target seemed to give ample leverage with which the Fed could lower real interest rates. But given the evidence that the equilibrium interest rate had fallen substantially even prior to the financial crisis, and that the Fed’s short-term policy rate remained at zero for seven years without sparking any large acceleration of aggregate demand growth, a reassessment of this target seems warranted. Such a reassessment is particularly appropriate when the lack of evidence that moderately higher inflation would harm Americans’ standard of living is juxtaposed with the tremendous evidence that a tighter labor market would improve Americans’ standards of living. 1. The real overnight interest rate is persistently, and unprecedentedly, low. This could change, but there's no good reason to expect it to. 2. A persistently low real interest rate implies that, to achieve a given inflation target - say 2% - the central bank must on average set its nominal interest rate target lower than was the case in days of yore when the real interest rate was higher. So, with the current fed funds rate at 1.16%, if we suppose the real interest rate persists at about -1.2%, this should ultimately put inflation above its target, to about 2.4%, by Fisherian logic. In the last tightening cycle, the fed funds rate reached 5.25%, and the target was reduced beginning in September 2007, to essentially zero by the end of 2008. So, if we take seriously the power of monetary policy working through reductions in the nominal interest rate in bad times, then a fed funds rate of 1.16% (or possibly more appropriately 1%) doesn't give the FOMC much room to cut, should things go south. Of course, it's possible that the effects of changes in short-term nominal interest rates on real economic activity are small, even in the short run, and/or the key tool of the central bank in a crisis, for example, is lending to illiquid financial institutions. Unfortunately, as in much of macroeconomics we can't (perhaps surprisingly) say for sure. But next, in the letter, it's stated: "...[as] the Fed’s short-term policy rate remained at zero for seven years without sparking any large acceleration of aggregate demand growth, a reassessment of this target seems warranted." First, "aggregate demand" is not something we observe - it's an undergraduate theoretical construct which, given its vagueness, shouldn't be bandied about by grownup economists. To be more precise, what the letter-writers have in mind, I think, is a Keynesian world with sticky wages and prices. In such a world "demand deficiency" is defined to be situations in which prices and/or wages are too high relative to efficient levels. So, (i) since the last recession (when the shock hit) is now going on 9 years in the rearview mirror, surely prices and wages have had time to adjust; (ii) the key symptom of "demand deficiency" is slack in the labor market. The chart above shows that the labor market is in fact unusually tight; (iii) I think the letter-writers think that a symptom of slack is inflation lower than the 2% inflation target. Low inflation is actually a symptom of persistently low short-term nominal interest rates. Ask, the Japanese about that (22 years with low interest rates and low inflation, and no sign of a sustained increase in inflation, even after throwing everything but the kitchen sink, i.e. higher nominal interest rates, at the problem), or read this accessible piece, or this one, which summarizes most of the more technical things I've written in blog posts. Basically, mainstream theory and the empirical evidence supports the neo-Fisherian view - that central bankers need to be more cognizant of the Fisher effect. That is, increasing (decreasing) the nominal interest rate makes inflation go up (down), and we can get this effect even in the short run. The letter-writers recognize, implicitly, that the Fisher effect is important for inflation targeting. In fact, the crux of the argument is that a higher inflation target implies a nominal interest rate that is, on average, higher, implying that there is more room to cut interest rates in a recession. But, the letter-writers don't specify how we get from here to there. Seemingly, what they imagine is that, if the Fed keeps interest rates low, either by foregoing further tightening or even lowering the fed funds target, inflation will eventually take off. Then, supposedly, the Fed can get inflation under control by raising the nominal interest rate sufficiently to its new "normal" level, and we'll be set. If only the world worked that way. Again, persistently low nominal interest rates do not lead to persistently higher inflation, in theory or in practice. The way for a monetary policymaking committee to get around this, in the face of stubborn Phillips curve beliefs, is to raise the specter of incipient inflation - "horrendous inflation is just around the corner, and we have to tighten now to get ahead of the curve." It's not a lie as, by neo-Fisherian logic, it's self-fulfilling. Given the current policy debate, you can see how even that position is an uphill battle. But, what about the 2% inflation target? Why keep it? 1. Many people have made this point, but it's the key one. The Fed has spent the time since Paul Volcker began his term in 1979 fighting for credibility. The view that the Fed will stick to 2% inflation forever is a strong belief - among financial market participants, economists, and lay people who are paying attention. We can't make a strong case for 2% vs. 4%, say, but we can make a very strong case that messing with the target is extremely dangerous, in terms of the potential for loss of credibility. And credibility is 90% of the game in the central banking business. 2. The Phillips curve model of inflation is basically a discredited theory. The parrot is dead. Admit it and move on. But, until that happens, people are being badly mislead by the dead parrot and its supporters. A central bank run by the letter-writers simply could not generate sustained 2% inflation, let alone anything higher, so they would be better off sticking with a low target, which they would undershoot anyway. The credibility problem again - better to miss by a little than a lot. I'll leave you with one last chart. 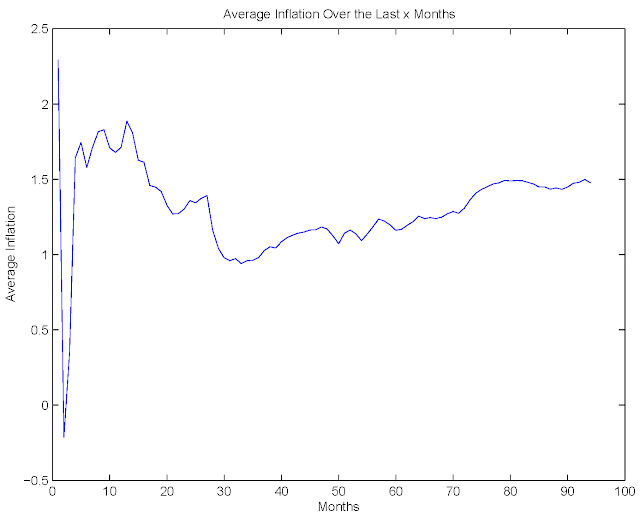 This shows inflation averaged over the last x months, where x is measured on the horizontal axis. So, the time since the end of the last recession is 94 months, and average inflation over that period (again, measured by headline PCE) was about 1.5%. The price of crude oil fell at about 34 months back, and you can see that in the chart. Fed "tightening" began at 16 quarters back, at which time you can see cumulative inflation increasing. Aside from some volatility in the last couple of months (completely normal), that's consistent with a neo-Fisherian view of the world: supposed "tightening" makes inflation go up. It certainly ain't going down.